The Dachshund is a long, low dog with short, powerful legs and a long tapering muzzle with very strong jaws and teeth. This breed comes in three coat varieties: smooth, long-haired and wire-haired; and in two sizes: standard and miniature (under 11 lbs.). The high-set ears are pendant, with rounded ends. The muzzle is slightly arched, producing a “Roman nose” effect. The sternum (chest bone) is very prominent with a depression or dimple on either side, providing a powerful front end for underground digging. The front paws may be angled slightly outward. The usual coat colors are solid red, black and tan, chocolate, and wild boar, but brindle, dapple, and piebald are also seen. Hunting, tracking, watchdog, and performing tricks. Lively and affectionate. Proud and bold, almost rash. Tenacious. Can be willful and clownish. Curious and mischievous. Very clever. Devoted to his family. Some fanciers feel the long-haired variety is calmer than the other two types. The wire-haired variety is more outgoing and clown-like. Children: Best with older, considerate children. Trainability: Slightly difficult to train. Combativeness: Fairly friendly with other dogs. Grooming: Smooth: Very little. Long: Brushing every few days. Wire: Occasional stripping. Trimming & Stripping: Wire: Occasional stripping. Coat: Short, feathered or wire. Outdoor Space: Does all right without a yard. Longevity: Moderately long-lived (12 to 15 years). Short-legged dogs have been known since Roman times, but the first evidence of Dachshunds is from the 1500s. The breed was specialized to go after den animals, particularly badgers, underground. 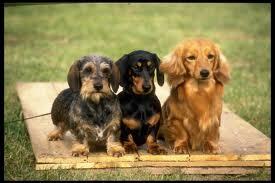 “Dachshund” comes from “dachs,” meaning badger, and “hund,” meaning dog. The Dachshund is still used as a rabbit and small game hunter today in some countries, and there are AKC field trials for the breed in the United States. It is also used to trail wounded deer. Today’s Dachshund is mostly prized as a companion dog.